I look forward to possibly seeing a video or a transcript of the proceedings, should be very informative. Thank you DBSJ for the information. i seriously wish i knew about this earlier, i would have attended i work very close by! Notable absentees are our Doctors Jayalath Jayawardana and Wickermabahu. Wonder whether impending Visit of our President to see the Queen is off the Agenda ! to frontline and question inactive of Srilankan Government and International Community. Good to see Rajiva make a fool of himself. What he said to Dr Manoharan was absolutely disgusting!! Hope to God Hilary watched this. The debate would have been better had it not have been for the hecklers in the audience, feel like some important points were missed e.g Mullivaykal and rehabilitated LTTE members still yet to return to their families and the the fact that the families still do not have any information about them. Sadly yet another event which highlighted the polarisation and disconnect that exists within the Sri Lankan diaspora. The Sinhalese with their perceptions that the defeat of the LTTE is the panacea to all the issues facing mother Lanka and the Tamil contention that terrible crimes were committed by the SL armed forces during the last stages of the conflict with impunity. Stephen Sackur, the chairman, was the consumate professional. Callum Mcrae was forthright in his views and defence and justification of his production. Yolanda Forster was very articluate in her analysis and her frustrations with the prevarications of the GoSL was very evident. Arun Thambaimuttu spoke with passion about what had happened to his parents at the hands of the LTTE and how he wanted to move on and not think about revenge or retribution. Prof Rajiva Wijesinha was sadly embarassing to say the least.For one as articulate as he is, his rambling and often incoherent replies left me bemused. He looked ill at ease and I for one was very unimpressed with his answers or more to the point his lack of answers. Perhaps this highlights the main problem facing th GoSL when dealing with an external audience -. the inability to present and articulate the GoSL point of view in a manner that is both coherant , rational and justifiable. No amount of PR work by Bell Pottinger or others will rectify this. Jan Janananayagam was nervous and kept referring to her lap top with her stock answers being statistics and quotes she was reading out verbatum. She did not appear to have the gravitas and depth that I expected. Reconcilliation can only happen if all parties actualy want reconcilliation. It should not be a case of the victor and the vanquished. It cannot also be on the basis of Sinhala, Tamil or Muslim land / areas as mother Lanka is one nation and its people should be Sri Lankan and not classify themselves as Sinhala, Tamil, Burgher, Muslim etc. If the views of the audience and speakers last night were but a microcosm of the wider SL public, then sadly winning the peace is still quite a long way off. i think rajiva writes better than he speaks, at least was the case on this occasion – his speech on rajivawijesinha.wordpress.com (which he wasnt able to deliver at the frontline club) is pretty good. Thambimuttu did great IMHO, looking forward to the video being posted up. The podcast is now available online on the frontline website. In such a context, it is hardly surprising that Sri Lanka has obstinately dug it’s heels in and continues to do so. This was pretty apparent on the panel.. It is interesting to listen to Arun Thambimuttu, he is being frugal with the truth. He knows full well why his parents were killed by the LTTE he will be more honorable if he tells the real reason for it. LTTE may not be holy holy and I am not holding out that view and may well have committed many atrocities. However Arun should be honest to give the background as to why his parents were killed. His father helped as a “facilitator” for a company Serendib SeaFoods that started a shrimp farm in the Eastern province. He was paid for his services. However when the factory went into operation, his assignment ended, but he continued to interfere with the management of the company and was trying to get the post of Manager. When the Board denied and he was told that his assignment is over and he has been paid for his services and that he should not come into the factory premises and bully staff he was angry. He took revenge by informing the police officer that Serendib SeaFoods was harboring tigers and was being used as a training ground. He came with the police and shot dead all the workers. Understandably LTTE was very upset with Thambimuttu senior and when the couple tried to migrate to Canada they were shot and killed outside the Canadian embassy. Since the shareholders of the company were foreigners and an entity registered in Hong Kong, the matter was referred to the international tribunal in the States and the government accepted blame and compensated the families of the victims. The founder / entrepreneur a well respected sri Lankan from Batticoloa was so disgusted in what happened, he left the country for good and returned overseas when he had spent most of his working life. Instead of having a dig at the Govt which is doing its best to look after the inhabitants ,the bloggers here should go to Srilanka and see how the poor people in the North as well as the rest are going about their daily lives, after the eradication of the LTTE Terrorism . Then you can see what real reconsiliation is about, rather than sitting in airconditioned comfort, after indulging in Chardannays and Reislings and Club sandwiches made by White Chefs. Despite all this Channel 4 propaganda, not a single Tamil person has been killed or injured by the Police or the Armed Forces.since May 2009. In contrast 3 Tamil Diaspora lives have been lost in Srilaka due to their own doing. Mr Callum Mcrae can better serve the Diasporians by doing something about his homeland, which is going through a Double Dip Recession, and allow the Srilankan inhabitants to enjoy what ever they can from the near Double Dijit Growth. After all, it will be the Diasporians who will be in the front line if not already there, when the British companies and of course Mr Cameron start the “Cull”. Arun Thambimuttu says that an LTTE who killed Muslims and children is living (as a refugee i guess) in Germany, but failed to note that the ‘Colonel’ of the group who did that is an Honorable Minister in the SL Gov now and he is also dear friend of his president Mahinda and an organizer of the party Arun Thambimuttu belongs. Funny he complained that the lady who lost her father to LTTE has ‘selective amnesia’ . There is no justification for a killiing spree. Simple Simon, tries to justify the killing of Arun’s parents . THe reasons why, when or how is irrevelevent. The fact remins that they were killed . However I do not understand why only he had to be compensated by the government. There is no justification for a brutal killing. Simple Simon tries to justify this babaric killing with excuses. It does not matter how,where or when, a killing is a most despicable, cowardly act. “Despite all this Channel 4 propaganda, not a single Tamil person has been killed or injured by the Police or the Armed Forces.since May 2009”. I must accept you have mastered interplanetary travel. Why don’t you visit Sri Lanka also? Did the Police or armed forces kill any Tamils before May 2009? You continue to maintain that there was not a single Tamil person killed prior to May 2009 by the Police or the Armed Forces. How do you explain that the killing had stopped after May 2009 whereas according to your own denial the armed forces are angels and had never killed any Tamils in the post independent history of the island? Please bear with me as I am bit thick. I admire your belief in secular Sri Lanka, one nation, one land,…….much repeated and abused political slogans, void of substance or credibility. Why cannot we have several nations in one country? If you think about it,I know it is very difficult for you, we could have a Sinhala nation, a Eelam nation, a Khilafah or Caliphate, a Buddhist nation, a Hindu nation, a Christian nation, ……………within a country to be appropriately named after my people,VEDDALAND. Don’t you think it is a “neat idea”? I agree with both your comments wholeheartedly. I am particularly unhappy with Rajiva’s performance – this was a golden opportunity and being in the public eye so often you would think he’d be adaptable if the event’s format changed. The guy rambled WAY too much, he should have been a lot more succint. As mentioned before, he writes better than he speaks. Simply he could directly answer the question immediately followed by qualifying the answer atleast. Instead he in a rambling way tried to first qualify an answer yet to be given, but because he rambled he didnt answer and went off in a tangent, many times! Bell need to run PR classes for GOSL. I wholeheartedly agree with you, there is no justification for the brutal killing of the innocent workers at the Serendib SeaFoods Factory at the direct instigation of Thambimuttu senior. He had an axe to grind for not getting the job he was eyeing so was keen to frustrate the company and decided to come up with a deliberate lie about it being used as a LTTE camp. He will have a lot to explain to the God almighty and Arun may wish to tell what he knows. I hope Kumudhini’s views serves to reinforce to Arun that his fathers actions resulted in all the families of the factory workers loosing their father, husband, breadwinner and having lost his parents he will better appreciate the atrocious act his father did. Kumudhini you misunderstood about the compensation, the families of those who were killed were compensated by the govt, not the owners nor the shareholders or directors. And lastly what does Colonel Karuna who ordered the killing has to say ? Arun should ask the government to investigate what happened and hold Karuna responsible for the killing of his parents. Loans of LKR 250,000 to each of the 11,000 rehalitated ex LTTE fighters are to be given, by the Govt, for them to start their own businesses. Not bad for these young people who spent most of their lives in bunkers and crawling on their stomachs to attack Sinhalese. How much Mr Prabakaran paid them is a mystery,although the Diaspora bankrolled their payroll. Now the same bankrollers turn a blind eye and hold gab fests in airconditioned auditoriums to plan how to roll the Govt and dismember the country. Is the Diaspora giving a guarantee that these loans will be honoured if and when the Govt is rolled and the country is dismembered with the Western Trade and Economic sanctions?. I refer you to Mr Sangakkara’s last few sentences at the Cowdrey lecture at Lords last summer. I too am an ” idealist” who is Sri Lankan first and last. What else he can do because he is the UPFA Ruleing Mahinda’s party chief organizer for Batticaloa district.and lives in Srilanka in the shadow of white vans. Ne// api dan minimarranne ne, api dan kanwa vitharmi ! Kalu Albert , Why are you lieing your lies making us feel like pouring petrol over fire. and If this is the way you are going to reconcile? Does the panal members aware why and whome did Sam Thambimuttu the MP kill to irk LTTE. Kalu albert, hallucinations and selective memory lose are also some of the early symptoms of Senil Dementia. I wonder your begining to get this dread full illness as there are some good treatments avalable why not go and see your psychiatrist. You should direct your question to Gota as he is the current curator of LTTE’s documentation and accounting books. One more thing, what did Gota do with the gold the army found in Vanni? I understand the the gold found in Vanni is more than sufficient to cover foreign exchange deficit for many years. Is it true? You don’t need outsiders to dismember the country. The Sinhala/Buddhists are capable of doing it themselves. They have been at it in the past 64 years. They can do it for the next 64 years. When the job is complete please allow the people of the island to rebuild a truly democratic country. It seems Kalu albert has Sworn to “speak nothing but lies” for rest of his life!!! Prof. Wijesinghe and Jan Jananayagam lost credibility as they were down right bias in their stands. Yolande Foster was very professional. Callum Mcrae was not very convincing as he too was obstinate in his stand. 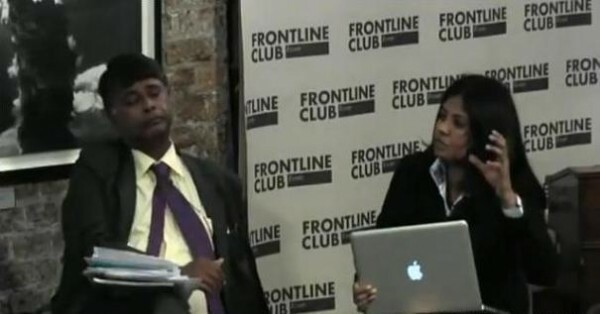 Sam Thambimutthu won the heart of many moderators although hackled by extremists. I wish Kumar Sangakkara represented Sri Lanka and Sam represented GoSL. I can not imagine why GoSL keep sending representatives to these talk show, when they do not have any stand or policy on LLRC or accountability. The IC wants only one thing accountability. If GoSL is not ready yet for this, avoid these talk shows without making clowns of themselves. “Why don’t you visit Srilanka?” asks Native Vedda. Although Diasporians shun Srilanka, their hosts visit in hords and buy every bit of land that they can get hold of along the magnificent beaches. A perch in Kattankady beach front is going for 3 to 4 Laks according a Muslim mate who lives there. Just imagine what it would be worth in Pasikuda up to Trinco, especially the Marble Beach front. Asking price for two a bedder now in Colombo 5 is LKR 20 Mil plus. Colombo 6 is still a bit cheaper as it is the Condo capital of Lanka. Although the prices dropped a bit when the LLTE supporter owners and occupiers fled after 2009, they are selling fast because of the lower price in comparison to Col 3 and 5. It won’t stay the same as Wellawatta is the most desirable location in Colombo for its accessability to swimming , fishing beach, eating out, and proximity to the Southern Highway as well as the new “Termini” for the Jaffna. Trinco and Batti bound super luxuary coach service. If Native stays away longer. even Mahiyangana will be out of reach with his green buddies locating to eco friendly abodes in the bush land in Srilanka..
I’m a budhist, our family was affected by the war, my point of view we are the people create LTTE by dominating tamils. As this Tamil guy said he lost his parents in batticaloa district by LTTE, area was under control of Karuna, this ideot kidnap my father as well. I have seen when I was 9year old how our army soldiers killed Tamil people, same way without any clothes beat them up, shot them with bound eyes throw them over the fire which made by tyres,petrol and wood. Also bring all the women even young children to the camp, sexually abuse them, I saw this with my own eyes, then killed them. Sri Lanka has got a history of killing innocent people. Then make them to take the arms to protect themselves. LTTE is not a terrorist group, they fight for their independent. They have their falts too. Why is it that the Diaspora donkeys are pointing fingers at Karuna? He was your hero when he was killing innocent Sinhala mothers and babies. Like one of the Tamil hecklers accused Arun of not been a Tamil during the debate maybe you guys can accuse Karuna of not been a Tamil as well. In the good old days of Sun Goat you guys would have seen some positive results for your blood money. This is fundamental problem with an imagined community. There is no such thing as Sri Lankan. It is only one name among many, that was manufactured after independence. In a few years time it could change, perhaps to “Republic Kingdom of Mahinda Dynasty”. Therefore this stupid idea of being “a Sri Lankan” should be rejected at any costs,in order to avoid another catastrophic historical blunder. Those who advocate the idea of “Sri Lankaness” are suffering from “false consciousness” for which there is no treatment. I know it is difficult for Sinhalese and Tamils to think. Sorry I cannot help you both on that. Who let Jan Jananayagam on the panel , sorry but she looks absolutely stupid , deranged and demented . She needs to be better prepared or give up this wholly and move on with other things. Isn’t it obvious, all Tamils are stupid. Arun is no better either as you know he too is a Tamil. You can see the similarities between stupid Tamils and stupid Sinhalese. Listen to Rajiva he made sure he too was no different to Jan Democracy. All in all stupid people representing two stupid peoples.